Every contact in your audience has a profile where you can view all available information about that person, including their marketing status, activity, contact rating, and more. You can also edit contact information or delete a contact from their profile page. In this article, you'll learn how to view a contact profile page and what information you can expect to find. Contact profiles can be accessed from contact table for an audience. You can also locate a specific contact profile with the Search tool. To view a contact profile, follow these steps. Click a contact's email address to open their contact profile. From their profile, you can view or edit their contact information. The top of a contact profile displays general information about your contact. If your contact uses Gravatar, we'll display their profile picture. If you use the Social Profiles add-on, we'll display your subscriber's Facebook or Twitter profile picture. This tells you how the contact was added to your audience. For example, whether someone subscribed to your email marketing or was added through a purchase. We’ll also include an additional message at the top of the profile if the contact you’re viewing isn’t eligible to receive marketing content. We'll display a label so you know if your contact is a subscribed, unsubscribed, pending confirmation, transactional, or cleaned. If you have a paid account and you've connected your online store, we'll display your contact's predicted gender and age range. We'll display a number of stars between 0 and 5 that represent a contact's engagement level. Contact ratings take into account open and click activity, past bounces or unsubscribes, and a few additional factors to determine a contact's engagement. 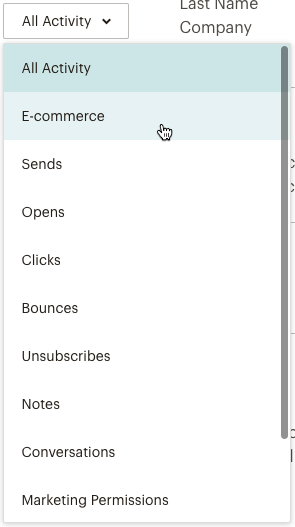 In this section, you can also use the Actions drop-down menu to unsubscribe or delete your contact, or tag them as a VIP. To learn more about updating contact information, check out Update a Contact Profile. Following the general contact information, you'll see a text box where you can add specific details about your contact as notes in their profile. For example, if you had an important conversation with a contact at an event, you can make a note of that in their profile to help inform your future interactions with them. These notes will live in an activity feed in their profile, but are only visible to you. The activity feed displays a visual timeline of your contact's engagement. Click the All Activity drop-down menu to view specific information, like e-commerce data or conversations. Shows purchases made through your connected store. If the purchase was made through a Mailchimp campaign, we'll display the campaign name. Shows which email campaigns your contact has been sent. Shows the date and time your contact opened email campaigns. Shows the date and time your contact clicked links in your emails. Shows any email campaigns that bounced when sent to this contact. Shows when your contact unsubscribed from your marketing emails. Shows the notes you've made about your contact. Shows any replies your contact has made to email campaigns. Shows the date and time your contact selected a field for GDPR consent. Shows which postcard campaigns your contact has been sent. Shows the date, time, and method by which your contact was added to your audience. The upper-right corner of the contact profile displays any tags currently assigned to the contact you're viewing. Click the Plus (+) icon to add a tag to your contact, or remove tags by clicking the X icon on the tag you want to remove. Get instructions for adding or removing tags from the contact profile. In this section, you'll see some overall stats that give you a snapshot of the contact’s engagement. You’ll see their email open and click rate, and total and average order revenue. Audience field data and additional contact information is split into sections. The data you find here may vary, depending on the list fields you have set up and add-ons you’ve enabled. 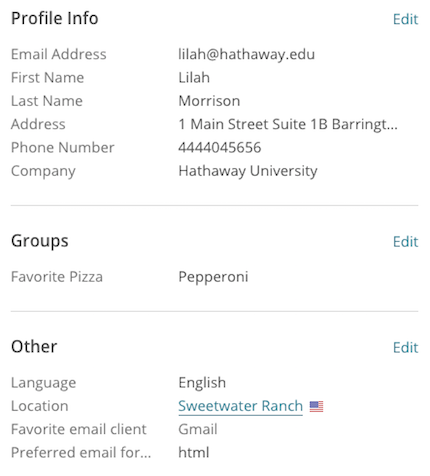 This is where you’ll view basic audience field data, including email address, name, and address and phone number. Any custom fields you set up will also appear here. If you have groups created for your audience, they’ll appear here. Additional contact details, including browser language, favorite email client, and preferred email format will appear here. If you have Social Profiles enabled for your audience, we’ll display a special section following your audience fields with publicly available social data about your contact. GDPR If your audience is GDPR-enabled, the contact’s opt-in preferences will appear in this section. If they subscribed using a GDPR-friendly form, you’ll also see the date and time of form submission. Click the timestamp link to view a text-based version of the form they used to subscribe. If your audience is GDPR-enabled, contacts added via the Mailchimp API are opted out of email by default. Mailchimp allows you to update contact information individually, and subscribed contacts can also update their own information at any time.